This Axle Back Exhaust is a true piece of art, with its mirror finish, stainless steel construction and seamless welds! 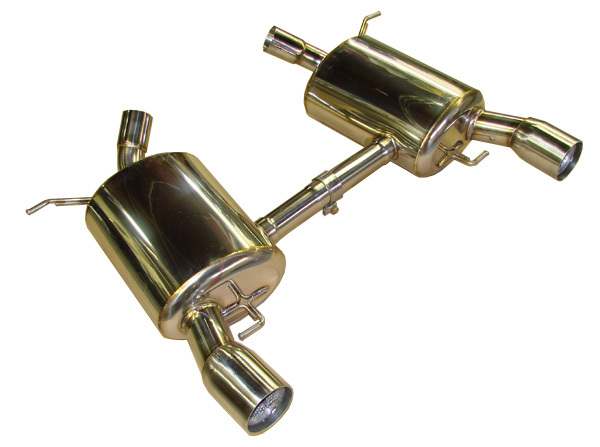 Are you looking for a high quality exhaust system? Rogue Engineering has your answer with their E90 335i IKON axle back exhaust. This Axle Back Exhaust is a true piece of art, with its mirror finish, stainless steel construction and seamless welds. Rogue Engineering is proud to introduce our E90 335i IKON Exhaust. Why would our first 335i exhaust be specifically for the E90 sedan? With a plethora of E92 335i exhausts on the market already, we thought it would be best to offer something specifically for the sedan owners first. With the unique twin turbo-charged 3.0L engine of the 335i, there is a tremendous abundance of performance potential. Our exhaust allows for free flowing exhaust gases to exit the vehicle more quickly, without excessive noise. You can hear the turbos slightly more, as a benefit. Our exhaust does NOT delete the secondary catalysts. NOTE: Limited inventory in stock for immediate delivery! This does NOT fit E92 (coupe) 3-series! Mil-finished pipes and muffler, mirror polished stainless steel quad 90mm angle cut, straight cut, staggered tips (with exclusive 3mm wall thickness, not just a piece of stainless steel tubing). Fits factory valence without modifications. Deep, throaty tone. NO Droning! All Rogue Engineering Diablo exhaust are produced using only 100% full T-304 stainless steel because of its consistent strength characteristics, corrosion resistance, and wide range of materials (important for controlling sound and exhaust flow).